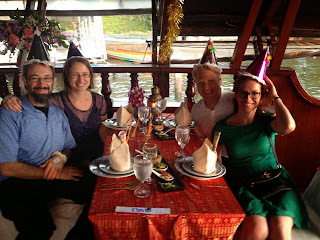 Drafts from Around the World: Dec 31 2013 - New Years Eve Bangkok Style! 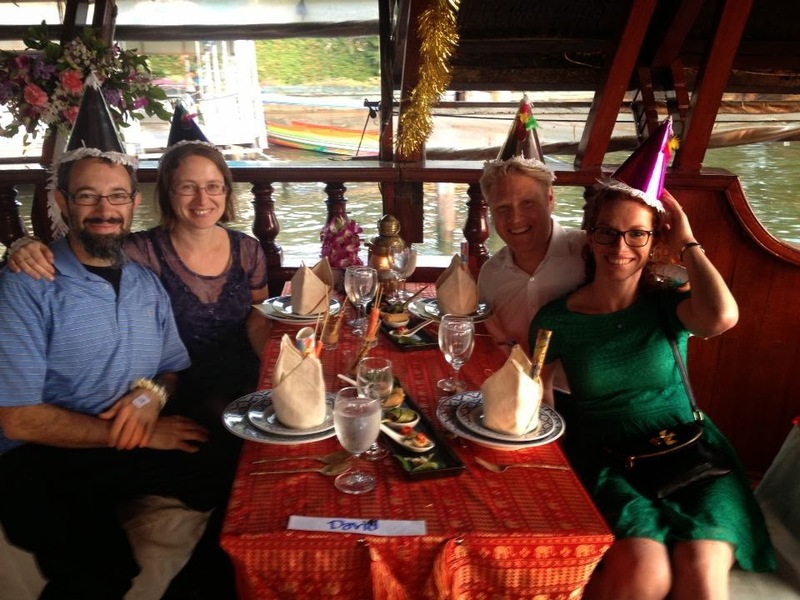 Dec 31 2013 - New Years Eve Bangkok Style! We started out at the mall, because when you have a couple hours to kill and you're staying in the middle of the city, why not have lunch at the food court? Malls in Bangkok are really cool, they are the heart of the city, keeping everything flowing around them. Huge supermarkets - with tons of cute groceries imported from all over Asia - are in their basements. Kiosks of knockoff goods line their hallways (you could get a fake name brand belt or tie for $3), and sometimes you ever find a real Starbucks directly next to a fake Starbucks. We ended up at the 56th Floor Red Sky Bar at about 9pm, we had a few hours to chat, enjoy the amazing views over Bangkok and fireworks, dance up a storm, and drink-drink-drink-drink (I think 4 more bottles of wine were ordered for the group????) We are completely innocent though, Fins Party Hard!! The four of us piled into a cab to go to our friends' hotel, our phone batteries all drained mid-ride and we were at the mercy for the driver. He got completely lost and took us to the Khao San Road (tourist/bar) District for no apparent reason, at one point I think he said something like he had no idea where the hotel was so he took us there. We had Pad Thai (and I think our Finnish friend ordered a TOWER OF SINGHA BEER??) and eventually found our way to their hotel by 5am. Then they packed up to head home to Finland and we decided it would be wise to see them off to the airport. The next thing I remember we were being dropped off at our hotel as the sun was rising. The Finns did the vast majority of the partying, let me assure you!! Then we spent a couple hours tasting every free sample in the supermarket under the Siam Paragon mall. 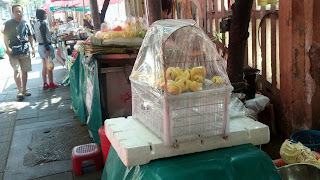 We bought all sorts of exotic fruits and took them back to the hotel for munching while we did laundry. After about 8 trips to Asia, I finally tried Durian fruit, which is so pungent that streetfood vendors keep it in a little saran wrap tent. It has a custard-like consistency, a smell of rotten eggs, and taste of onions. Not as bad as I expected! Kicking off the New Year Bangkok style!! Sounds like fun but I don't think I could keep up! Love the fake Starbucks next to the real one. I wonder which one was there first. I also love that the taxi driver brought you to the wrong place because he didn't know where the right one was. Sounds like some of our travel adventures. Jan 2 2014 - Cycling through Bangkok!